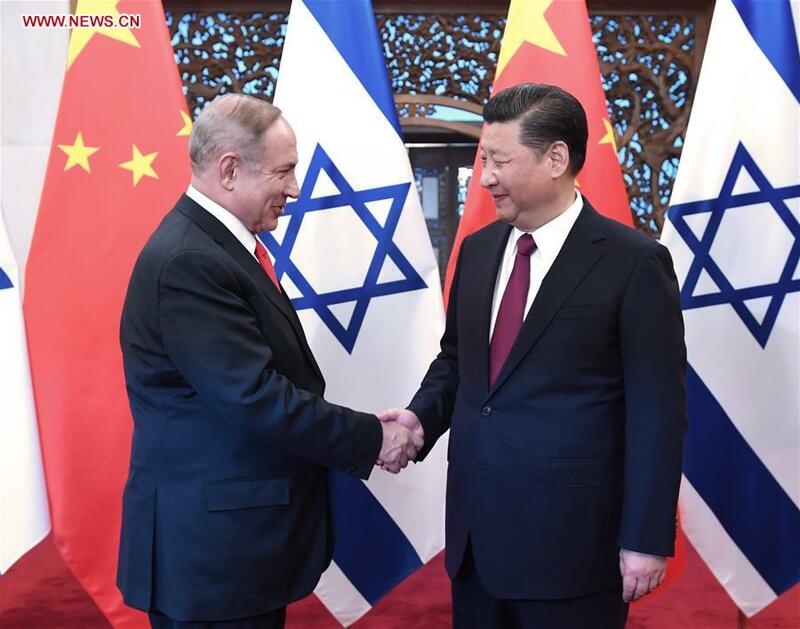 BEIJING, March 21 (Xinhua) -- Chinese President Xi Jinping and visiting Israeli Prime Minister Benjamin Netanyahu announced in Beijing on Tuesday an innovative comprehensive partnership between both countries. In their meeting, Xi hailed the progress of bilateral relations since the forging of diplomatic ties 25 years ago, adding their innovation cooperation has facilitated sustained growth of overall relations. The establishment of this partnership will boost innovation cooperation and bring more benefit to the two peoples, Xi said. Netanyahu voiced his country's adherence to the one-China policy, urging taking the opportunity of the new partnership to enhance cooperation in areas such as clean energy, agriculture, investment, finance and medical services. According to a joint statement released on Tuesday, the two countries agree to closer exchanges among young technological personnel, and cooperation in joint labs, a global technology transfer center, innovation parks and an innovative cooperation center. China and Israel expect closer cooperation in air pollution control, waste management, environmental monitoring, water conservation and purification, as well as hi-tech fields, said the statement. Xi called on both countries to enhance political communication, synergize development strategies, and strengthen cooperation in key areas such as water resources, agriculture, medical care and clean energy. Israel hopes to participate in the Belt and Road Initiative, he said, adding that his country expects to see China play greater role in Middle East affairs. China's top legislator Zhang Dejiang also met with Netanyahu on Tuesday. He said the National People's Congress values its friendly ties with the Israeli parliament. Chinese Vice Premier Liu Yandong and Netanyahu co-chaired the third meeting of China-Israel Joint Committee on Innovation Cooperation on Tuesday. Netanyahu is on an official visit to China from March 19 to 22 at the invitation of his Chinese counterpart Li Keqiang.